WordPower 100 is now available for all users of Grid 3. To access the WordPower grid sets you will need Grid 3.0.24 or above. Open Grid 3 click on Menu and then the orange exclamation mark – this indicates that an update is available. Remember you need to be connected to the internet to update Grid 3. To upgrade without opening Grid 3, open your Start menu and use Smartbox Update, this will check for updates for all your Smartbox software. Once Grid 3 is up to date, you can add WordPower 100 in the same manner as other grid sets. From Grid Explorer, click on Menu and then Add. 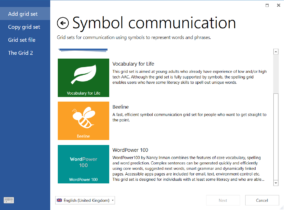 WordPower will be added to your Grid Explorer, select Open to begin exploring and communicating straight away.